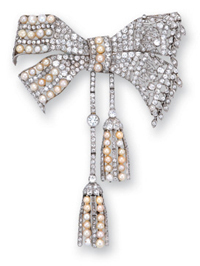 Diamond and platinum garland-style brooch. When miners unearthed large deposits of platinum in the early 1900s, avant-garde jewellers began experimenting with new looks that took advantage of this precious metal‚Äôs special characteristics. 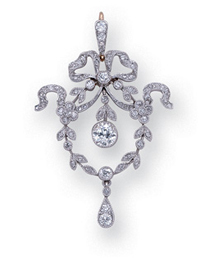 Foremost among the innovators was Cartier, which produced pieces of delicate garland motifs in platinum that seemed to further enhance the brilliance of diamonds. Other jewellers in Paris, London, and the United States, lost no time in copying this new garland style, adding all manner of bow-knot and tassel motifs to their designs. The much greater strength of platinum made openwork compositions more easily feasible and a new fashion quickly emerged. However, due to platinum‚Äôs initial scarcity and high cost, the earliest pieces tended to have only a thin layer of this metal fused to the underlying gold foundation. As platinum became more widely available, the vast majority of jewellers discontinued this technique. 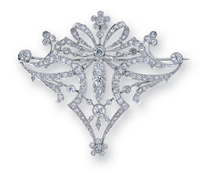 During this period, it was also observed that using platinum for pins and clips on the backs of brooches was impractical, since this metal tended to bend too easily. For this reason, gold continued to be favoured for this purpose. When white gold was finally developed in 1918, all brooch backs were made of this new alloy, since it proved to be more rigid and the colour blended better with platinum. This practice has continued ever since. A white gold alloy made mainly with the addition of nickel was developed as a substitute for platinum, but never really caught on for use in high-end jewellery due to its initial lack of malleability. The emphasis was to try to make diamonds blend in with platinum. Diamond settings were increasingly fine in detail, taking advantage of platinum‚Äôs durability and malleability. It is not surprising that so many of these pieces survive intact, so much so that today, the savvy collector appreciates these jewels for their unsurpassed craftsmanship and artistic merit. 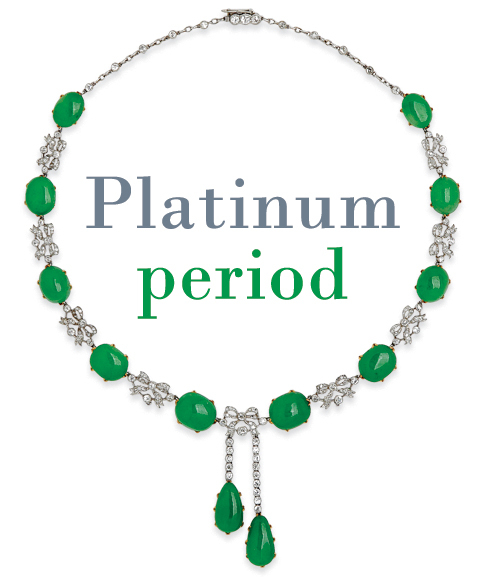 The speed at which jewelers have embraced platinum is noteworthy.